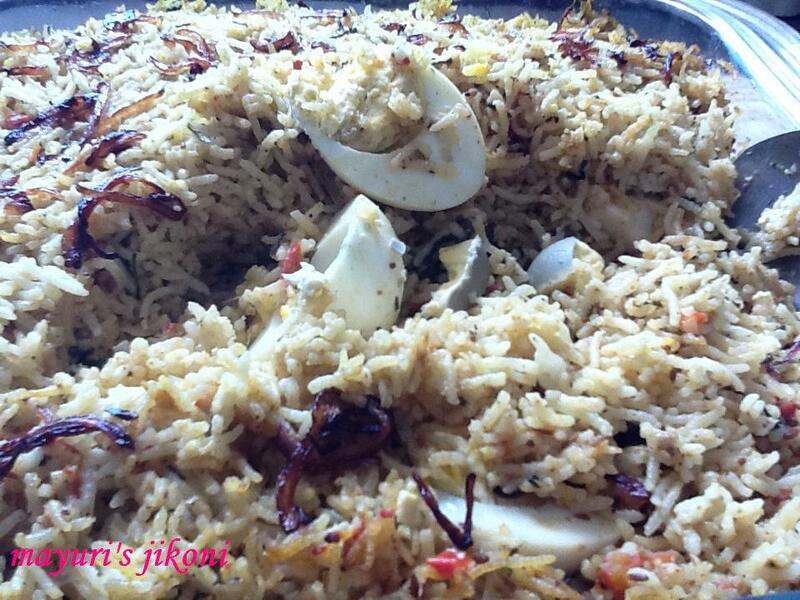 A few weeks ago I had a request from one of my neighbours… can you please teach me how to make an egg biryani. That got me thinking. When was the last time I actually made egg biryani? I just couldn’t remember. It’s also not a recipe that I had written down so I couldn’t just give it to her to follow. So we got tinkering in the kitchen and as we went along, wrote down the ingredients we used. I must say it turned out pretty yummy and the neighbour’s family too were happy with the end result except that they found it mild. Cooking rice has its own charm. After the smell of bread, I think my other favour aroma is that of rice cooking. An ideal Sunday lunch meal as after that everyone can doze off, laze around and pretend they cannot move an inch! Enjoy the recipe. Most of the spices required are readily available in any Indian grocery store. Wash the rice under running water. Add the water and let it soak for 30 minutes. Add the rice along with the water into a deep pan or a rice cooker. Add the rest of the ingredients mentioned under ‘for rice’. Cook the rice till it is done. When the rice is done, turn it out into a wide tray or plate for it to cool down completely. Separate the grains gently using a fork. For this recipe you want separate grains of rice and not a soggy mass. Heat oil in a pan over low heat. When it is slightly hot, add cloves, cinnamon, star anise, cardamom and roast for a minute or so. Add cumin and fennel seeds. Keep on stirring and roast till the seeds begin to crackle. Take the pan off the heat and let the roasted spices cool down a bit. Grind the roasted spices in a food processor ( I used my coffee mill for this). Add the coriander cumin powder, turmeric , red chilli powders and asafoetida to the ground spices. Mix it very well and keep it on the side till required. Heat oil in a deep pan over medium heat. When the oil is hot add to it ½ a cup of the onion slices. Add a pinch of salt and sugar and stir fry the onions till they become brown. Take the pan off the heat. Remove the browned onions from the oil with a slotted spoon and keep it on the side. Add 1 tbsp ghee to the remaining oil. Heat it over medium heat. Add the remaining onion slices and stir fry them till they begin to turn pink or light brown in colour. Add the garlic, ginger and chilli paste and stir fry for a minute. Add ground masala mixture, chopped tomatoes and mix it well. Add the salt, sugar and ½ cup yogurt. Cook till the tomatoes become soft. Add the rice and remaining yogurt and mix well but gently. Grease a baking tray with oil or ghee. Add half the rice to it. Layer the halved eggs over it. Top it with the remaining rice. Cover the tray with a foil and put it into the hot oven. Remove the biryani from the oven after 20 to 30 minutes. Sprinkle the browned onion over the biryani and serve piping hot with some raita, plain yogurt, papads, masala chaas etc. For a more spicier biryani, increase the amount of red chilli powder or green chilli paste. Add fried cashew nuts, almonds, pistachios and raisins if you like. If the rice has become a bit soggy, use less yogurt. For a vegetarian version, add fried paneer cubes instead of eggs. Lightly fry the paneer in the oil and leave it in a bowl of water till required. Prepare a spicy yogurt to serve with the biryani. Add some finely chopped green chillis, coriander, mint, garlic (1 or 2 ) and salt to the yogurt. Mix and serve. Add a few boiled peas and boiled potato chunks to the rice if you like. Cook the rice in a method that you are use to. I love using the rice cooker. If you don’t have coriander cumin powder, roast 1 tbsp of coriander seeds and an extra ½ tsp of cumin seeds while making the masala.